Since its introduction in 1975, the Boeing 747 Combi has helped airlines around the world meet their long-range passenger and cargo requirements. The combi has a large side-cargo door behind the left wing, plus equipment that removes passenger seats and installs cargo tracks, giving airlines the option of carrying cargo in containers on the main deck behind passengers. This flexibility allows airlines to adapt the interior configuration to meet variations in seasonal markets and charter demands. Another reason for the combi's popularity is that it can be scheduled through an airport with the same turnaround time as any other passenger 747. Cargo operations do not interfere with passenger service, because main-deck cargo loading occurs in an area of the airplane where normally there is no activity. This simultaneous passenger-and-cargo-loading/unloading operation is possible because of the stability allowed by the fore and aft arrangement of the wing and body landing gear. The large side-cargo door on the main deck allows cargo loading in the aft section at the same time passengers are boarded in the forward section. A locked partition separates the passenger compartment from the cargo area, accessible only by the crew. Roller trays on the 747's aft floor facilitate loading of 8-foot-wide (2.4 m) containers, or pallets, up to 20 feet long (6.1 m). The airplane's main deck can accommodate any container or pallet used in the aviation industry today in lengths of up to 20 feet (6.1 m). The combi can handle large volume shipments such as automobiles, small boats, heavy machinery, drilling equipment and even small aircraft or helicopters. Environmental control in the cargo area allows transportation of live animals, perishable foods and cut flowers/vegetables, while maintaining separate environmental control of the passenger cabin. The 747-400 Combi incorporates additional fire protection, a two-crew digital flight deck, advanced engines, wingtip extension with winglet and new interiors. 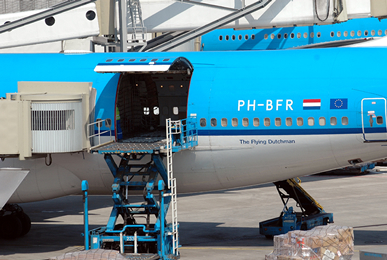 The first customer for the 747-400M Combi was KLM Royal Dutch Airlines. The stretched upper deck of the 747-300 and 747-400 Combis can accommodate 44 more passengers than the standard 747-200 Combi. The 747-400 Combi is currently the only combi in production. More than 30 customers operate a total of 144 747 Combis, including 58 747-400 Combis.